C-H-E-A-P Old Spice Body Wash starting 3/31! 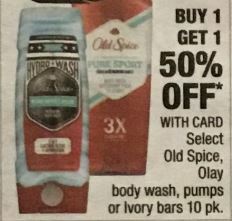 Starting 3/31 Old Spice Body Wash is on sale B1G1 50% off. Combine with a MFR Coupon and a CRT and pay ONLY .47 cents each! Pay: .94 cents or .47 cents each!